While you’re busy putting chlorine in your swimming pool to get rid of the algae, your neighbor down the road is busy drinking it for breakfast. It’s true — algae has become a well-documented and proven health product, with many experts even dubbing it a superfood. There are many types that are consumable by humans, with the most common by far being blue-green algae. This group includes popular dietary supplements like spirulina and chlorella. Brown algae has also been studied for its benefits to humans. Most likely you’ve heard of these things, but you might not know much about how algae works. It’s not just pond scum — it’s a diverse group of plant-like organisms that could have major implications for your health. Algae can be single-celled or multi-celled, can be found in freshwater or saltwater, come in many colors and shapes, and can be any size from microscopic to hundreds of feet long. Their function is to form the bottom of the food chain and to produce oxygen. In fact, they are so efficient at producing oxygen that they can be fed increased amounts of waste carbon dioxide from power plants and industrial facilities. They are also excellent at producing and storing oils and nutrients which is their unique way of amassing energy. These substances are beneficial when consumed by other organisms — including humans — and can also be used in industry. Algae are a source of plant matter that is so far relatively untapped. Scientists are working on developing ways to use these versatile fast-growing plants not only as health supplements but also to make products like biofuels, bioplastics, fertilizers and animal feeds, to purify wastewater, and rehabilitate contaminated land. Which types of algae are used for health supplements? The type of algae most commonly used for human consumption are blue-green algae. This group includes spirulina, chlorella and the curiously-named Aphanizomenon flos-aquae, or AFA. All of these types of algae are grown in freshwater lakes, with spirulina mostly produced in Mexico and Africa, chlorella in Japan or Taiwan, and AFA in the United States. Brown algae have also been researched for various human uses. They are grown mostly in cold water marine environments, either attached to rocky coasts or floating freely. One of the main beneficial constituents of algae is chlorophyll. This is the pigment that makes plants green and which they use to create energy from sunlight. Algae are one of the most potent providers of this rich energy source for all of the other creatures up the food chain (including us). Algal oil, the oil found in algae, is a valuable source of omega 3 fatty acids such as EPA, DHA, GLA and ALA. This is a good way to get these fats from a plant source if you are vegetarian or vegan, or want to get your supplements from a sustainable source. Algae are also a plentiful source of protein. In fact, the Aztecs in Mexico used spirulina as one of their primary protein sources for hundreds of years. Many other valuable nutrients can be found in algae, including Vitamins A, C, E and K, many B vitamins, enzymes, and minerals. The nutrients in algae are thought to be particularly well absorbed by the human body. It’s no surprise, then, that we can benefit from consuming algae! But what exactly do these multi-talented organisms do for our health? Should you make algae a regular part of your holistic wellness regimen? Check out all of these potential health benefits. Studies show that blue-green algae can fight three of the major causes of heart disease. They have been found to improve blood lipid profiles, reduce inflammation, and reverse oxidative stress. Algae also contain plant sterols which are known to reduce bad cholesterol and decrease the accumulation of plaque which can clog arteries. The omega 3 fatty acids, chlorophyll, and other phytonutrients in algae are known to fight inflammation and have potent antioxidant activity. This is true for blue-green algae as well as a Mediterranean red alga called Laurencia obtusa. Brown algae have also been used against chronic conditions such as arthritis and fibromyalgia. Many types of algae, including brown and blue-green, have been researched for the ability to inhibit cancerous growths and protect against the side effects of chemotherapy and radiation when existing cancer is being treated. Brown marine algae in particular have been studied for weight loss purposes. They contain a pigment called fucoxanthin which helps the body burn more fat. 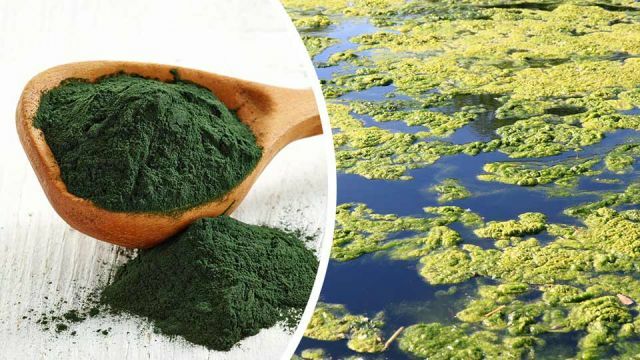 Blue-green algae have been used for general digestive support, and we know that more effective digestion can lead to a healthier weight. Certain algae like chlorella help free the body from heavy metals like lead and cadmium. Blue-green algae can also protect our most important detoxification organ, the liver, against non-alcoholic fatty liver disease, and lengthen the amount of time that our stem cells are able to regenerate. It certainly sounds like many types of algae hold amazing promise for protecting against diseases and helping the human body function as it should. You can find algae in capsule, tablet or powder form at your local health store, or online. The dosage will depend on the product, but in general we recommend using algae a few times a week to fill in any nutritional gaps in your diet and boost detoxification. If you use chlorella, consider taking it away from other foods to ensure it doesn’t remove nutrients you want to keep. An easy way to incorporate algae into your daily routine is to find a greens powder you like and simply add a scoop to your lemon water or smoothie. Drink algae with your breakfast and enjoy the many benefits! Hey Buddy!, I found this information for you: "21 Reasons You Should Drink Algae Every Morning". Here is the website link: https://www.thealternativedaily.com/21-reasons-you-should-drink-algae-every-morning/. Thank you.